The 68th Berlin Independent Film Festival is underway and luxury brand Glashütte Original introduce a new watch. The stunning Senator Chronograph – The Capital Edition watch is definitely a fashion statement. The Berlin Film Festival 2018 is one of the biggest in the world. Running from February 14-20, 2018, celebrities, dignitaries, people of wealth and film lovers have gathered in Berlin, Germany to take part in the 68th Berlinale. 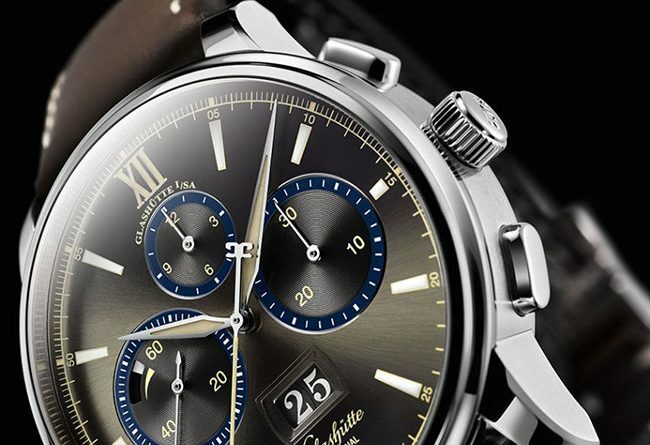 Glashütte Original is proud to present its special, limited edition Senator Chronograph – The Capital Edition watch. This fine watch is both striking and oh so luxurious. The Senator Chronograph – The Capital Edition can be described as “Engineering Made in Germany.” Next, throw in a little big city attitude and you have an amazing new luxury watch collection a man would be proud to own. The Senator Chronograph – The Capital Edition reflects the urban attitude to life in the large and vibrant city of Berlin, Germany. First of all, the Glashütte watch collection blends reliable precision along with a robust readiness for everyday life. So wear it proud and with confidence. Plus, the watch provides everyday reliability. Therefore, its functions and tunning design make it the ideal companion for contemporary trendsetters. As 2018 moves forward, the Capital Edition watch collection makes a perfect gift. Whether for your husband, boyfriend, father, good friend or business associate, any man would love to wear it. In addition, mark a special occassion like a birthday, anniversary or job promotion with a gift the man in your life will always remember. The watch dials have been fashioned in-house. Designed with “Bourbon Grey” hues for both stainless steel and red gold models. It’s a striking look that will impress. The limited platinum version comes in a “Dry Silver” hue. Furthermore, all watch models capture a person’s eye with classy beige, white and blue details. In the dark, Super-LumiNova highlighting provides a stylish green glow. As a result, the white gold hour and minute and stop seconds hands boldly stand out. You’ll notice the Roman numerals at hours of both 6 and 12. Lastly, the hour indexes offer up optimal legibility throughout winter’s cold, night time hours. The metal bracelet has a patented 8-step fine adjustment mechanism that will guarantee optimal comfort. Plus, this feature in the stainless steel version, will be appreciated by gentleman who will wear this luxurious mens watch. In addition, both the platinum and red gold versions of the Senator Chronograph – The Capital Edition come in a special collector’s box. Inside the gift box, you’ll find an additional watch strap. This new watch collection was made for the urban gentleman. Take a look and we look forward to hearing your thoughts. Let us know if you are looking for a unique gift. Please use our luxury shopping service. Are you interested in owning the new Senator Chronograph – The Capital Edition watch for men? Contact us for additional information and availability. Stop by soon to follow our luxury blog. Keep abreast of the latest luxury watch news and product releases.